Before I go into my review, I have to make it clear that I was going through a huge reading slump during this. Whether this affected my overall enjoyment of the book or not it is hard to say. What I will say is that this is a well written book, that captures a small town on the cusp of self-destructing, while dealing with one of the most brutal crimes. Writing a mystery book has to be difficult, with lots of planning involved on creating misdirection and red-herrings so that the reader doesn’t know whether they are coming or going. 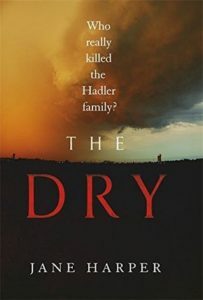 With The Dry, the mystery surrounding the death of the Hadler family proceeds at a rather leisurely pace. This is mainly due to the fact that to the community, it is an open and shut case with the father having murdered his wife and son, before killing himself. It is only through the suspected perpetrators parents does his childhood friend agree to stay a few extra days to investigate the case. What I really rather enjoyed about this book was the fact you were taken on the journey with Aaron and when he discovered a new clue, so did you. I was trying to piece the bits together and I could see why Aaron pursued each line of enquiry. The conclusion was satisfying to this plotline, but I couldn’t decide whether the author was so clever in planting the VERY subtle clues or if it was an accident. I’m hoping it was the former because when you think of it and re-evaluate the clues, it did make sense. However, the secondary plot of the book was the one that really pulled me in. In the back of my mind, I couldn’t help but feel that the two cases were related in some way. Yet, no matter how I turned it over my mind I couldn’t see a clear link. The book has really strong theme of never really escaping your past and that even though you think you have moved on, it can pull you back if things are left unresolved. This is most evident in Aaron, who was chased away from the town due to the incident that happened twenty years ago. Through him, I bore witness to a person who is unable to resolve some of his regrets couldn’t be resolved due to the time that has passed or events that have happened.. Since it a small town, the inhabitants will not easily forgive or forget and with Aaron’s return the scandal resurfaces. The only people who treat Aaron with anything other than hostility are those that are outsiders, who have come to the town after he had left. It makes an interesting comparison to see how the different groups react to his return. Though it took me a little while to get into the book, overall I really did enjoy it once I got my groove back. Witnessing the mystery and investigation play out was compelling stuff. There were many blind alleys and red herring throughout the book, until the final act played out. If you are a fan of the TV show Broadchurch, this is a book that I would really recommend you check out. The ending is… interesting.